Ring shopping in Santiago | Blog the world!!! As most of you know WE’RE ENGAGED! Yes that’s right, engaged and it is very exciting indeed. But at present my finger is naked, Tim bought me a beautiful proposal ring in Cusco (whilst I was suffering from the Altitude Sickness) but it is too big for my ring finger so is firmly placed on my fattest finger (this is still not fat enough to keep the one-size-fits-all ring on my finger, some sales people are unscrupulous). 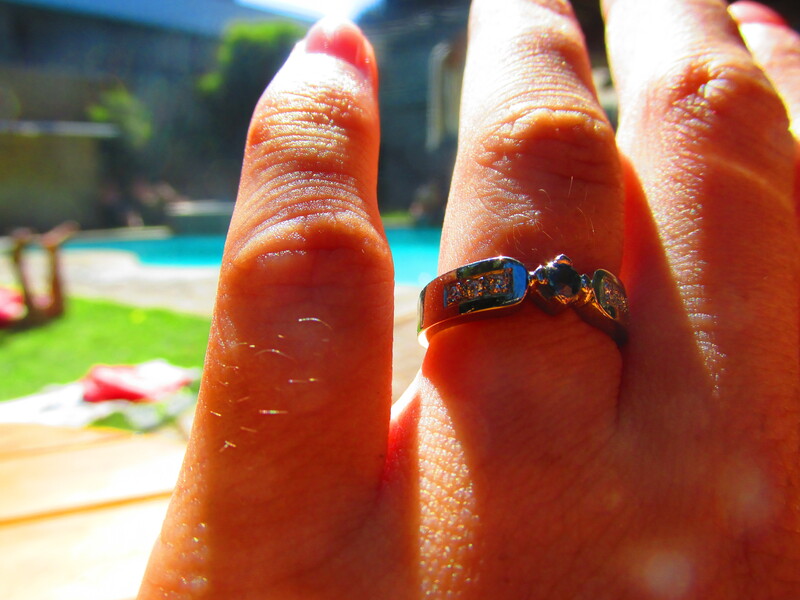 At the time of engagement, Tim promised me another ring – a proper engagement one. Now a huge part of me thought ‘don’t be silly’. The ring I have is extremely pretty, a silver band with a pearl flower, and could easily be resized. But the girl in me just couldn’t say no to more jewellery so we began our search in Santiago. We searched the city centre for a nice little joyeria and found nothing but tacky and/or blingy pieces. As a result we hit google. This is how we managed to find Sconio Joyeria near Estacion Escuela Militar. There were a few in the area that we had a quick look in first, most were not even close to what we were looking for but there was one upstairs in the shopping centre that had a beautiful sapphire and diamond eternity band. The joyeria was small and smelt of stale smoke. It was ran by an old couple and had a few antique pieces. In truth it didn’t look like much, but you could tell the jewellery was the real deal and it became our backup. The area around our chosen joyeria was mainly suburban, quite wealthy and close to what looked like a financial district. It was a thoroughly enjoyable walk from the station and when we got there we rang a buzzer to get through the gates to the joyeria and sports shop. Strange combination I know, but who am I to question it? When we go in we attempt our Spanish once again ‘Tienes una anillo compromise, par favour?’ and the lady ushered us in. We muddled through in our incredibly basic Spanish and managed to order a beautiful sapphire and diamond ring with 18k white gold. Really I wanted a simple sapphire only ring and I had my eyes on a thin band with square edges and a solitaire sapphire, but the lady was insistent my second favourite was better… as long as I opted for mini diamonds either side of the sapphire. I ummed and I ahed and I still couldn’t decide and nor could Tim. The lady was very keen we picked the one with the diamonds. In fact she was so keen she made both rings the same price. We still couldn’t make up our minds. Then the lady had a great idea and brought out a wedding band for me to try with the ring. It fitted perfectly with the sapphire and diamond ring. It didn’t look so great with the other. My mind was made up, after all it would only be on my finger alone for a year or so before its partner joined it. We returned to collect it a few weeks later after our trip to Mendoza. Either she learns English very fast or I have a sneaking suspicion she could speak it all along and just wanted to see us suffer. Still we managed to order exactly what we wanted… well, with some additional diamonds and I hate to say it, but she was right, they are perfect with the sapphire.